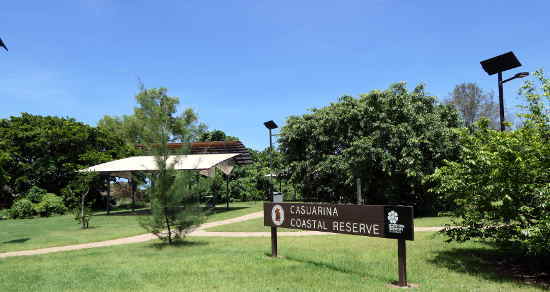 Casuarina Coastal Reserve stretches along to coast from Rapid Creek to Buffalo Creek and includes most of Darwin's most popular beach areas. 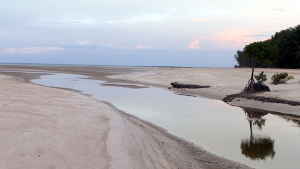 At low or medium tides it is possible to walk all the way from one end to the other, with Sandy Creek the only place where you need to get your feet wet. During high spring tides the sea prevails and there are only limited stretches of sand that can be easily accessed. 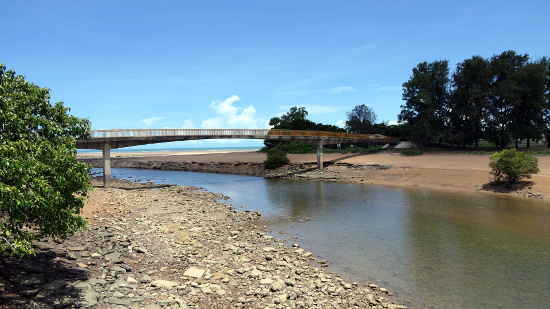 The footbridge provides pedestrian and cycling entrance to the coastal reserve from Nightcliff, connected to the bike track that runs along Rapid Creek and on to the Nightcliff jetty and boat ramp. Across the bridge you are welcomed to the Casuarina coastal reserve by new recreation facilities providing toilets, shaded areas and BBQs. Vehicle access to this area is from the end of Trower Road, with a new sealed road that runs along the back of the beach from here, past Casuarina Beach and the Surf Club to the Free Beach car park. 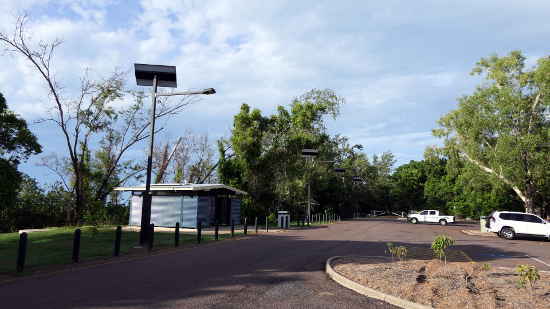 Facilities at the entrance to the reserve. 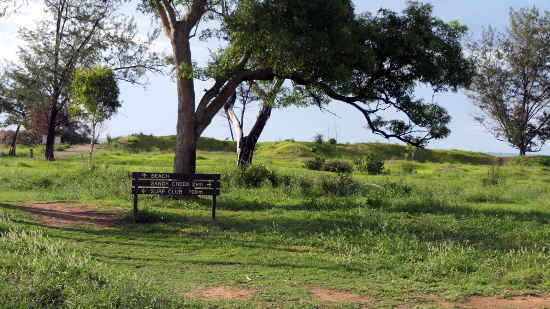 The reserve has been divided into several different recreation areas to accommodate different activities. For dog lovers there are different areas to watch for, some allow dogs off leads, some require dogs to be on leads and some areas prohibit dogs altogether. 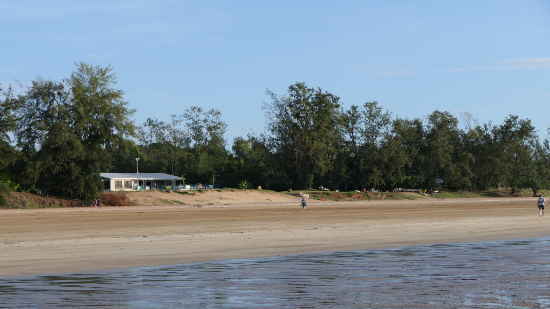 The Darwin Surf Life Saving Club (DSLS) is located between the Casuarina Beach and the Free Beach, with vehicle access from the road that runs behind the beach. 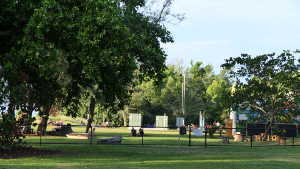 Lots of green grass and shade make the DSLSC a popular place. A licensed bar is open from 5pm on Friday and Sunday. There is also a function room available for hire. 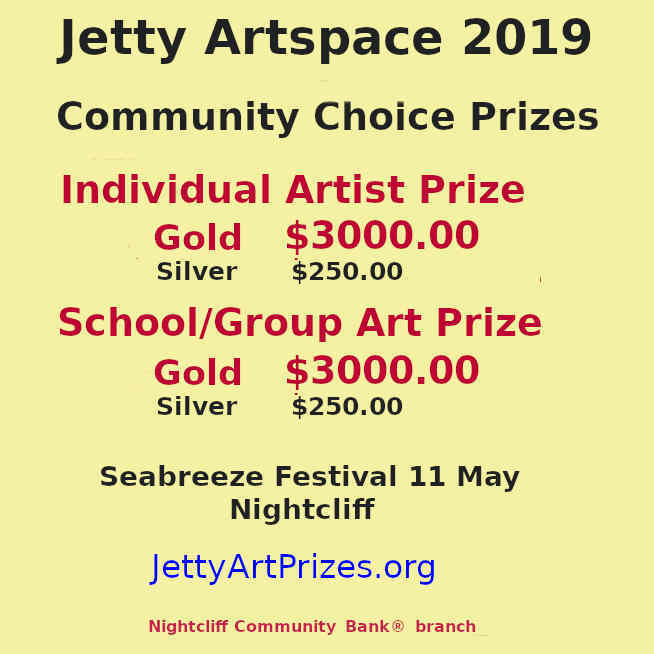 Of course there are all the usual activities associated with a surf club, swimming, surfboat rowing, life saving skills and patrols and so on. Call 8945 0447 for more details. 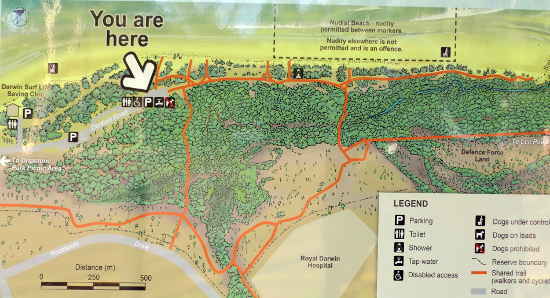 There are information boards located at popular spots and car parks to detail the activities permitted in the immediate vicinity. The information board below is located at the Free Beach car park. 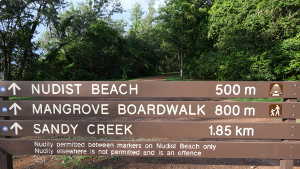 Information board at the Free Beach car park details the immediate area. Good sign posting through the reserve. It would be hard to get lost here, there is good sign posting in addition to the information boards with their detailed maps and comments. This is the end if the sealed road at Casuarina beach, vehicle access to Lee Point Beach is via lee Point Road. There are several car parks along the back of the beach with walking tracks onto the beach. Walking tracks from the various car parks provide access to the beach. However you can walk to Sandy Creek and further if the tide is low enough. 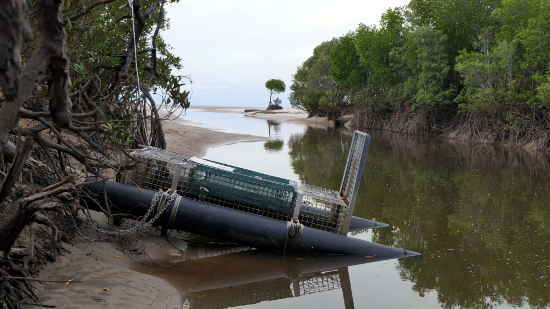 The photo below shows the crocodile trap at Sandy Creek at low tide, as you can see the creek is only a trickle across the beach, but remember the croc trap is there for a reason. Crocodiles don't need much water to hide in so keep to areas where the water is ankle deep and visibility is good. Especially in the wet season, crocs can be on the move as the bigger ones force smaller crocs to seek safe water. 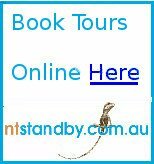 Return to Enjoy Darwin home from Casuarina Coastal reserve.